On August 1, 2018, Clean Wisconsin sued the Environmental Protection Agency (EPA) in federal court, challenging a rule that exposes thousands of Wisconsin residents to ozone pollution. This unjust rule is just one in a series of Trump Administration policies that ignore air pollution at the cost of harm to public health. Ground-level ozone (O3), often called “smog,” is an ambient air pollutant that harms our lungs and makes breathing difficult. Ozone forms from two precursors—nitrous oxides (NOX) and volatile organic compounds (VOCs)—which are emitted by mobile sources (such as cars and trucks) and stationary sources (such as power plants). When these precursors react in hot sunlight—when people are more likely to be outside—they form ozone. Inhaling ozone is particularly harmful for children, the elderly, and people with respiratory conditions. Ozone pollution can exacerbate and trigger respiratory conditions such as asthma, chronic obstructive pulmonary disease (COPD), bronchitis, and emphysema. Most parts of Wisconsin have exceptionally clean air, which allows us to enjoy our summers outdoors without sacrificing our health. 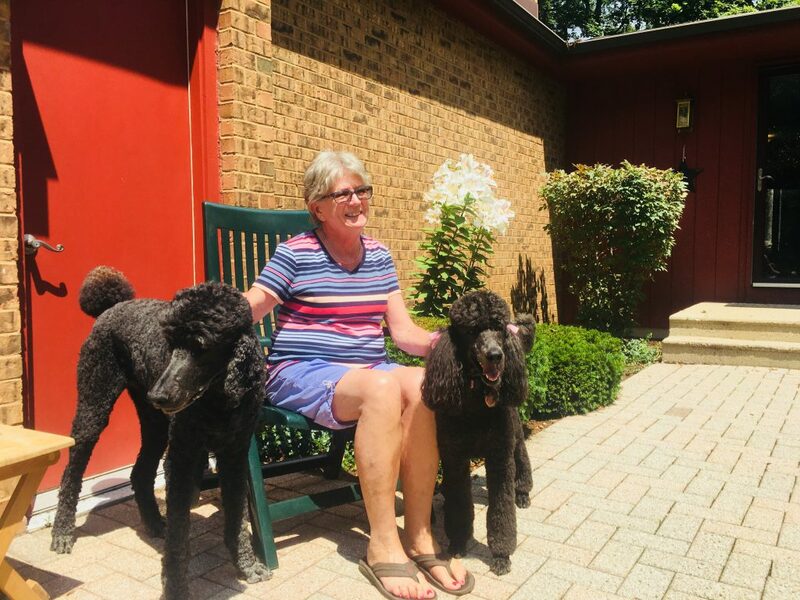 In fact, many of our members have told us that they go outside constantly in the summer to exercise, garden, entertain, and relax. However, high concentrations of ozone pollution in Door, Kenosha, Manitowoc, Milwaukee, Ozaukee, Racine, Sheboygan, Washington, and Waukesha Counties endanger the health of those who live, work, or recreate in those counties every time they go outside on summer days. The Clean Air Act requires that EPA protect the public from health impacts of ozone pollution. To do this, the EPA must determine which areas of the country need to reduce concentrations of ozone pollution to a level that meets health-based standards. After EPA identifies these areas, the Clean Air Act requires the states where they are located to take affirmative steps to reduce ozone pollution, and EPA holds states accountable for their progress. To evaluate improvement and to prevent backsliding in air quality, the Clean Air Act requires EPA to assess air quality to identify areas that fail to attain federal health-based ozone standards every five years. In December 2017, EPA identified all the areas indicated in green on the accompanying map as areas that fail to meet the health-based standards for ozone pollution established by the Clean Air Act. Less than six months later, EPA made significant changes and, in its final rule, designated only the areas indicated with hash marks as failing the health-based standards for ozone. Clean Wisconsin is challenging the final rule because it does not protect the residents of the nine eastern Wisconsin counties, and it leaves children, the elderly, and people with respiratory conditions are especially vulnerable to the health impacts of ozone pollution. 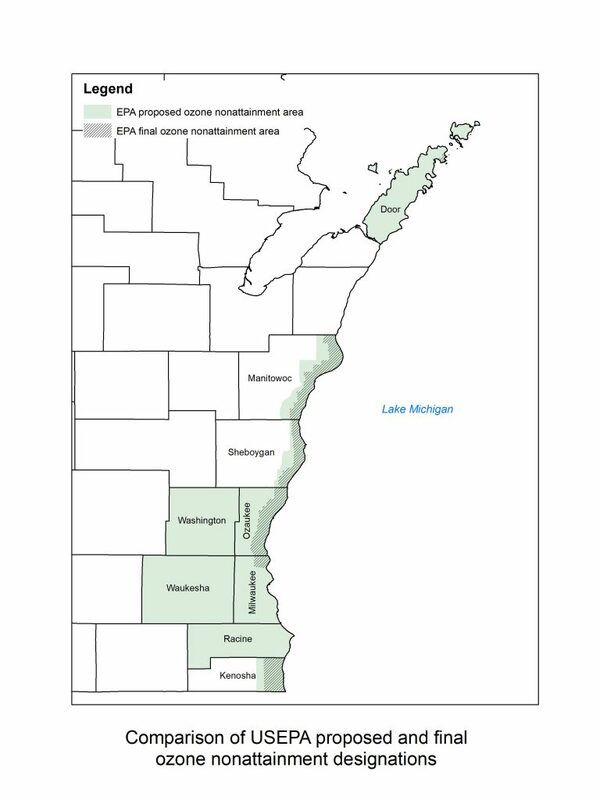 If our legal challenge is successful, EPA will have to return to its original proposal and require that all of the areas of Wisconsin shown in green on the accompanying map reduce their ozone. This action is about making sure that all Wisconsinites have clean air to breathe so they can live happy, healthy lives. Everyone, no matter where they live, needs the same clean air. Thanks to the support of our members, we can defend the clean air that makes Wisconsin a great place to live, work, and play. Want to get more involved? You can learn more about ozone pollution in Wisconsin at cleanwisconsin.org/our-work/our-air and spread the word about why clean air matters on social media using hashtags #ourairourhealth #cleanair #cleanwisconsin.